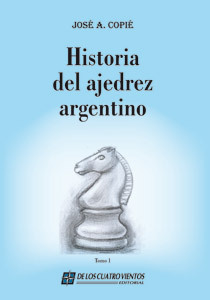 Chess in Argentina has had a rich and eventful history, correspondence GM José Copié has begun what promises to be multi-volume history of chess in Argentina, this first volume focuses on the history of the Club Argentino de Ajedrez. The remaining volumes will cover the other important chess clubs, major tournaments, national championships, team tournaments,chess composition, correspondence chess and other subjects. The Club Argentino de Ajedrez is one of the most prestigious chess clubs not only in Latin America but in the world. But before we begin with the history of the club proper , there is brief introduction on the beginnings of chess in Argentina from colonial era to the years of independence; Argentina has suffered through many an economic crisis and repressive governments, and GM Copié has made some effort to put chess in Argentina in it's historical context. From it's inception in 1905 the club has had a busy schedule of club and team tournaments. Many European players visited the club in those early years: Richard Teichmann, the then world champion Emanuel Lasker, Boris Kostic and José Raul Capablanca before he become world champion. a rematch that was not be. But the everyday life of a chess club is it's local members (obscure and the famous), and it is the club tournaments and club championships that is justly the focus of much of the narrative. Stalwarts of the club have included Miguel Angel Gelly, Julio Lynch, Carlos Portela, Oscar Panno, and Hugo Spangenberg. Oscar Panno is perhaps the most well known outside of Argentina as a former world junior champion and after a distinguished international career. Players like Miguel Najdorf and Roberto Grau though not members of the club also figure in this first volume and are sure to reappear in future volumes. The Olympiad of 1939 is somewhat covered when Argentina benefited from influx chess talent due to Germany's invasion of Poland and the beginning of second world war,perhaps a more detailed account is forthcoming in a future volume. I hope that future volumes will include a game index, and an improvement in the game diagrams is needed (there is not enough definition between the light and dark squares.) The placement notes is also confusing, their placement not a the bottom of the page nor at the end of the book, but at the end of a section to be followed immediately followed by a new section make finding a note a bit of a challenge. But these are minor quibbles in comparison to the importance of this endeavor. There are 16 pages of illustrations; I did not count the number of games but I would hazard a guess on the conservative side of over a hundred. So if you have at least a smattering of Spanish and a interest in chess history I can wholly recommend this book.